Tuesday is one of the best days of the week for fast food deals and restaurant specials including half-price burgers, pizza BOGOs, taco specials and free kids meals. Here’s our roundup of Tuesday deals at national restaurant chains. Bar Louie has Five Dollar Burgers at many locations on Tuesdays. Choose your burger and get potato tots or fries for just $5 (less than half price) from 5 pm to close. To see if the deal is good at your local Louie’s, select your location at the Bar Louie website then scroll to the bottom to view the local specials. Beef ‘O’ Brady’s has two tacos for $5.99 in their Tacos on Tuesdays special at participating locations. BJ’s Restaurants have daily specials on Mondays through Thursdays. On Tuesdays get half off wine by the glass or bottle and $3 Pizookie® desserts. For more details see: BJ’s Restaurant Specials. Black Angus Steakhouse has daily deals every day but Saturday. On Tuesdays and Sundays enjoy an all-day happy hour with food and drink specials. For more details see the Black Angus Daily Specials Menu. At Bob Evans, kids 12 and under eat free on Tuesdays from 4 PM to close. Bonefish Grill has a “Hooked on Tuesday” menu with three-course meals starting at $15.90. More details on the Bonefish Hooked on Tuesday website. Boston Market has a new Rotisserie Brisket dinner for about $14 on Mondays and Tuesdays. Available on Monday and Tuesday evenings starting at 5 p.m. and while supplies last, Boston Market’s beef brisket is slow-cooked in a rotisserie and served with a BBQ sauce, choice of two regular sides and fresh-baked cornbread starting at $13.99. For more details see the Boston Market Home Page. Brann’s Steakhouse has $1 Margaritas until 8 pm on Mondays and Tuesdays. For more details see the Bran’s Steakhouse Promotions Page. 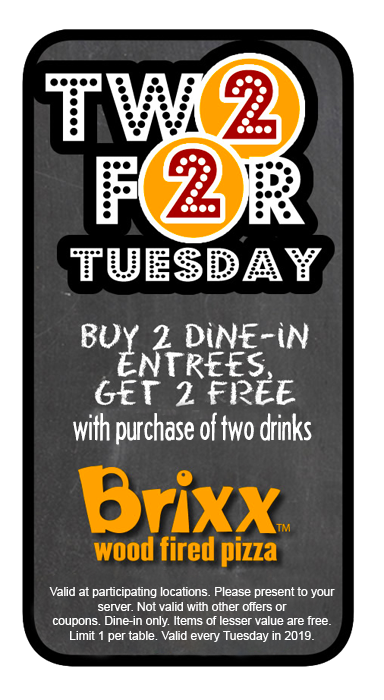 Brixx Woodfired Pizza has a 2 for 2 BOGO with this coupon good on Tuesdays through December 31, 2019. CLICK HERE for your Brixx coupon. Good for two free entrees when you buy two entrees and two drinks at regular price. Good on Tuesdays at participating locations. At some locations the deal is good only after 5 pm. Print the coupon and present it to your server, or display it on your smartphone to redeem. Buffalo Wild Wings has wing specials on Tuesday. Most locations offer a buy one, get one free deal on boneless wings. CLICK HERE to find out if your location has the wing BOGO. Cafe Rio Mexican Grill has a daily deals menu with tacos, enchiladas, tostadas and more starting at $5.99. On Tuesdays get a Burrito or Salad for $6.49. For more details see the Cafe Rio Daily Specials Website. Price and participation may vary by location. Charlie Brown’s Fresh Grill has weekday meal specials including unlimited shrimp and ribs. To view the current daily specials visit the Charlie Brown’s Daily Specials Page. Chuck E. Cheese Pizza has a Two for Tuesdays special. Get two Large 1-Topping Pizzas for $22 every Tuesday. ($25 for select Metro areas and $30 for Canada). The chain announced the special on the Chuck E Cheese Tuesday Specials page. Cracker Barrel has Weekday Lunch Specials starting at $5.99 and every day Dinner Specials starting at $7.99. For more details see: Cracker Barrel Daily Specials. Del Taco has regular tacos priced at three for $1.49 every Tuesday from 3 PM to 11 PM. Offer valid at participating locations, for a limited time only. More details on the Del Taco Specials website. At Denny’s, kids eat free from 4 PM to 10 PM every Tuesday. On Tuesdays from 4 p.m. to 10 p.m., diners can receive up to two free kids’ meals for children ages 10 and under with the purchase of an adult entrée. Kids can choose any dish from the Kids’ Menu. Good at participating locations; you may want to call your local Denny’s to confirm participation. Denny’s announced the special in this press release. El Torito has $2.99 Taco Specials in the Cantina, every Tuesday from 3 PM – 10 PM. You can find the deal announcement on the El Torito website. Fazoli’s has a Daily Deals menu. Get lunch for $5 till 2:30 PM on Mondays through Fridays. On Tuesdays, you can get kid’s meals for 99 cents. Huddle House has free kids meals every Monday and Tuesday. Get one free kids meal with each adult entree purchase of $6 or more. Huddle House announced the special on the Huddle House Deals page. JimBoy’s Tacos, a chain in CA and NV, has Ground Beef Tacos for just $2 each on Tuesdays. Made with fresh, never frozen, perfectly seasoned ground beef, American cheese hand grated daily, crisp iceberg lettuce – all encased in a stone ground corn tortilla and dusted with Parmesan cheese. The chain announced the weekly special on the JimBoys Tacos Specials Page. At K&W Cafeteria kids 12 and under eat free on Tuesdays. Get one kids lunch or dinner with an adult entree purchase. The chain announced the weekly special on the K&W Specials Page. Long John Silver’s has $1.50 Baja Fish tacos on Tuesdays. Good every Tuesday now through May 14, 2019. The weekly special was announced on the Long John Silver’s Home Page and on Facebook. Marie Callender’s has a kids eat free deal on Tuesdays. Get one free kid’s meal for each adult entrée purchased. Good at lunch or dinner. More details at: Marie Callender’s Weekday Specials. Marie Callender’s also has additional specials at lunch and dinner, plus a Happy Hour menu with half-priced appetizers and other deals every day. McCormick & Schmick’s has $2 Fish Tacos during happy hour on Tuesdays. Also get a Tito’s Mexitini for $5. More details at the McCormick & Schmick’s Taco Tuesday Page. Miller’s Ale House has a new Daily Specials menu with lunch and dinner specials starting at $5.99. Papa Gino’s, a New England pizza chain with about 100 locations, has 50% off on Mondays through Wednesdays with thus promo code good through May 1, 2019. Enter coupon code 7226 when you order online to get 50% off an online pizza order. Good at participating locations. Cannot be combined with other offers or discounts. For more details or to start your order see the Papa Gino’s Specials announcement. Papa Murphy’s Pizza has $10 Tuesdays most weeks with large pizzas with up to 5 toppings for $10. (This deal is $12 in some markets.) To find out if the special is good this week see the Papa Murphy’s Deals Page, where the deal will be posted. $10 deal is valid select Tuesdays online and in store on any large menu pizza or CYO up to 5 toppings. Excludes FAVES, sides, gluten free, and dessert pizza. Pei Wei Asian Diner has Chicken Teriyaki Rice Bowls for $7 every Tuesday. Get a regular size Teriyaki rice bowl with chicken, tofu, or veggies for just $7. Add steak or shrimp for $1 more. No promo code required. Good at participating locations. Pei Wei announced the weekly special on the Pei Wei Tuesday Specials Page. Quaker Steak & Lube has a $10 Tuesday special. Get select entrees and sidecars for $10. Also add a bucket of domestic beer for $10. Good at participating locations. For more details see the Quaker Steak Tuesday Special Page. Quiznos has a $5 Toasty deal of the day. On Tuesdays get a Turkey Ranch Swiss Toasty for $5. Good for a limited time at participating locations. You can find the menu and more details at: Quiznos Deal of the Day. Red Lobster has a new Weekday Win early dining special every Monday through Friday between 11 a.m. and 6 p.m. Each special is priced at $15. On Admiral’s Feast Tuesday treat yourself to Red Lobster’s take on a classic fish fry for $15. Enjoy Walt’s Favorite Shrimp, bay scallops, clam strips and wild-caught flounder. All fried until they’re perfectly crisp and golden. You can find the complete Early Dining menu at: Red Lobster Weekday Win. Rubio’s has Fish Taco specials after 2:30 pm every Tuesday. Get Original Fish Tacos for just $1.75 and the Fish Taco Especial for just $2 every Tuesday after 2:30 pm. Also get $1 off alcoholic beverages at participating locations. No coupon required. More details at: Rubio’s Special. Ruby Tuesday has a kids eat free deal every Tuesday. Get 1 free kids meal for each adult entree purchased after 5 pm. The chain announced the deal on the Ruby Tuesday Home Page. Good only at participating restaurants. Sonic Drive-In has half-price cheeseburgers after 5 pm Tuesdays in their Family Night special. Sonic announced the Family Night special on their Deals Page. Offer includes single-patty SONIC® Cheeseburgers (approx. 1/4 lb. precooked) only. Add-Ons cost extra. Not good in conjunction with Combos/other offers. Valid while supplies last at participating SONIC Drive-Ins. Tijuana Flats has two tacos, chips and a drink for $5.99 every week in their Tijuana Tuesdaze special. The Tex-Mex chain announced the deal on the Tijuana Flats Home Page. Price may vary by location. Togo’s Sandwiches has a daily deal on Mondays through Fridays at most locations. The deal includes a 6-inch regular sandwich and 20 oz fountain drink for $6.95. The sandwich selection for Tuesdays is Ham and Swiss. (Deals may vary by location.) For more details see the Togo’s Daily Deals Announcement. Village Inn has a free kids meal every Monday and Tuesday. Get a free meal from Village Inn Kids’ Menu, with the purchase of an adult entrée. **Kids Eat Free program available at participating location only. Valid for Kids’ Menu item from the Kids’ Menu for one child 10 and under with the purchase of an adult entrée. No cash value. Not valid with other discounts, coupon offers or promotions. Dine-in only. Beverage, pie or dessert not included. For details see the Village Inn Promotions Page. Wingstop has 60-cent boneless wings on Mondays and Tuesdays. Wingstop announced the special on the Wingstop website. Wing Zone has daily specials on Mondays through Thursdays. On Zesty Tuesday a Zesty Wing Basket (5 wings, wedge fries or chips) for $7. Wing Zone announced the special on the Wing Zone Specials Page. World of Beer has a Taco Tuesday special. Get tacos for $2.50 and $3.50 all day every Tuesday. World of Beer announced the weekly special on Facebook. Also, if you’re an AARP member, you can get every day discounts at Denny’s, McCormick & Schmick’s, Outback and more places. You can find all the details in our story, AARP Dining Discounts. Note: Specials can vary by location and most are for a limited time only so check with your local restaurant to see if they have the deal you want. Some deals are not good on holidays.